You see professional ballet dancers wearing them onstage. And this, you already know: they are beautiful, glittery, ethereal, like moving pieces of art. But like all things ballet, the illusion created supersedes the reality. Things are not as they seem in the magical world of tutus. I’ll never forget the first time I put on a tutu costume. 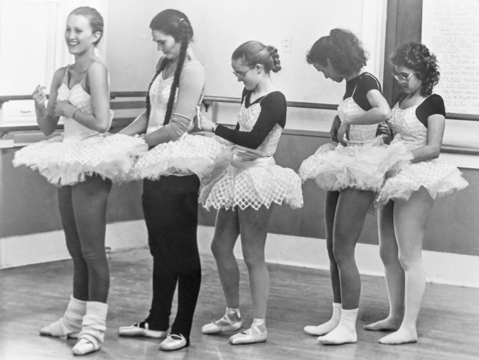 I’d rehearsed with a practice tutu (more on those later) but the real deal was such a thrill, an honor. And, shockingly, rather uncomfortable. And, well, maybe a little bit redolent of body odor from the others who’d worn the costume, year after year, before me. Others, who’d sweated and strained and smudged makeup and perspiration into fabric that felt rather coarse against my skin. The seamstress hooked me up from behind—yikes, hard to breathe—and I was directed to a mirror while she assessed the fit. One look at my reflection, the costume in all its sparkling splendor, and my complaints died away instantly. All right. Ready? Here are ten things you probably didn’t know about tutus. 1) They’re expensive. A teenaged, pre-professional dancer entering a competition might pay $1000 for one. 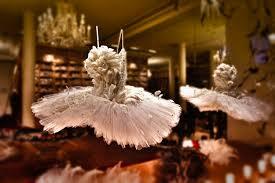 The average professional tutu costs around $2,000. More jewels and feathers and glitter can bring the price up even higher. Granted, you can go online and find one for $200 or even $20. I’ll just say this: you get what you pay for. 2) Dancers don’t wear tutus in ballet class. Sorry, little girls. Had to get that bad news out of the way first. At their cost, costumes are for the performances and dress rehearsals alone. In rehearsals, however, a practice tutu will be used, which is the same shape/size as the real deal, which is necessary for the dancers to acclimate with their partners and/or the space around them, what it will feel like onstage. Lifts and partnered pirouette turns, for instance, become a different situation when a tutu is involved. Particularly for the guys, who, in a lift, might now have a lot of tulle in their faces. Rug burn is not uncommon. And suddenly you can’t stand as close to the dancer while assisting her in a pirouette. A big puffy doughnut around her middle has changed the rules. 3) They’re difficult and time-consuming to make. Even when made by a professional, they can take up to three weeks, or between forty and sixty hours, to construct. Professional tutus have ten to twelve layers of net sewn in, (interesting factoid: Paris Opera Ballet uses thirteen layers; in Italy it’s ten or less) and amateur tutus, for cost and time efficiency, tend to have six to eight layers. 4) The tutu itself is just the poofy skirt. The bodice is usually sewn into the basque; there is an upper basque and a lower basque. A practice tutu is just the lower basque. 5) They can’t be washed. Well, certainly not between performances. Because they’re so delicate and festooned with glittery bits like jewels and beads and feathers and sequins and such, they must be deconstructed in order to separately wash the bodice, the tutu body without the embellishment layer. All of it is a bit of an ordeal, and therefore spot-cleaning must do the job. Hello, Febreze! 6) They aren’t particularly comfortable. We’re not talking a stretchy, Lycra kind of material. The bodice needs to be durable and snug fitting, and while the lower part, sort of like a swimming trunk, is going to be stretchy to accommodate legs and bending and such. Altogether, it can be an itchy fit. And you want it to be a tight fit. Which means it can be constricting around your ribcage. As in, feeling like you’re wearing a corset. But oh, they are so beautiful. And when they fit snugly, the way a pointe shoe must fit, as well, the final effect is ravishing. 7) They use a ton of material. 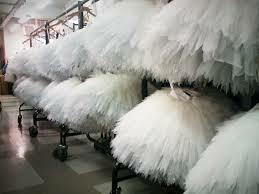 Each tutu requires roughly 100 yards of tulle, a type of net fabric. The embellishment is a final layer, detachable (if necessary), that is its own work of art, with beads, feathers, lace, jewels, you name it. 8) There are half a dozen types. Here are the main ones: Romantic (longer, diaphanous, covers knees; think Giselle and Les Sylphides); pancake (or classic), and powder puff. There’s “bell” too, but that’s not so common anymore (think Degas paintings). And “saucer” or “platter” tutus, which speak for themselves, right? What you usually see onstage in story ballets are Romantic, if it’s Giselle or from the early-to-mid-19th century, and classic if the ballet originated later in the 19th century. Within a classic/pancake tutu you’ll find a support hoop, a crinoline wire, to help the tutu maintain its shape. (The layers of tulle are hand-tacked to keep them straight out and stiff.) Neither the bell nor the powder puff tutus have a wire. Russian émigré Barbara Karinska designed the powder puff for Balanchine’s New York City Ballet dancers. A former professional embroiderer, her creations were intricate works of art. The skirts are shorter, less layers, un-tacked, so the end result is fluffy and self-supporting. Karinska was the one to figure out that if you cut the material for the side panels of the bodice on the diagonal, it would naturally stretch a bit and allow the dancer to breathe better. Thank you, Barbara Karinska! 9) A bodice has two or three rows of hooks and bars down the back so that the costume can fit more than one dancer. With them costing so much, most companies have to take the thrifty approach: alternating casts share the costume, and the costumes get stored away and pulled out once the company performs the ballet again. It would be far too costly to recreate costumes for every revival. And thank goodness for fellow dancers, who are kind enough to hook you up from behind. The Classical Girl, circa 1984. Kaw Valley Dance Theatre. Photography: Mike Manley. 10) Cleaning the costume with vodka? Of course! A fun fact I learned while researching this post: vodka acts like Febreze to get rid of body odor in fabric, without that fake, perfumey smell. You simply mix cheap, high-proof vodka with water (roughly 70 to 30 percent vodka-to-water ratio) and pour it in a spray bottle. Spray it liberally on the area in question. Vodka dries odorless and kills odor-causing bacteria. Here’s a fun little video feature on making a ballet tutu, where LA Weekly profiled the work of tutu seamstress Sarah Bacon. The company Tutu Etoile offers great information, including how to clean a tutu (here’s where I learned you can clean your costume with vodka). This entry was posted in 10 Things, Ballet and tagged Balanchine and powder puff tutu, ballet costumes, Barbara Karinska, bell tutu, classic tutu, clean a tutu with vodka, differences between tutus, fun facts about ballet, fun facts about ballet dancers, fun facts about dance costumes, how to clean a tutu, Kaw Valley Dance Theatre, Romantic tutu, Tutu Etoile, tutu seamstress Sarah Bacon, Tutus, tutus for ballet, what ballet dancers wear on December 14, 2015 by admin.